WARFARE — Prehistoric Eras to 600 C. E.
The Romans had formerly used small round shields; then, after they began to serve for pay, they made oblong shields instead of round ones; and what had before been a phalanx, like the Macedonian phalanxes, came afterwards to be a line of battle formed by maniples, with the rearmost troops drawn up in a number of companies. The first line, or hastati, comprised fifteen maniples, stationed a short distance apart; the maniple had twenty light-armed soldiers, the rest of their number carried oblong shields; moreover those were called ‘light-armed’ who carried only a spear and javelins. This front line in the battle contained the flower of the young men who were growing ripe for service. Behind these came a line of the same number of maniples, made up of men of a more stalwart age; these were called the principes; they carried oblong shields and were the most showily armed of all. This body of thirty maniples they called antepilani, because behind the standards there were again stationed another fifteen companies, each of which had three sections, the first section in every company being known as pilus. The company consisted of three vexilla or ‘banners’; a single vexillum had sixty soldiers, two centurions, one vexillarius, or colourbearer; the company numbered a hundred and eighty-six men. The first banner led the triarii, veteran soldiers of proven valour; the second banner the rorarii, younger and less distinguished men; the third banner the accensi, who were the least dependable, and were, for that reason, assigned to the rear-most line. When an army had been marshalled in this fashion, the hastati were the first of all to engage. If the hastati were unable to defeat the enemy, they retreated slowly and were received into the intervals between the companies of the principes. The principes then took up the fighting and the hastati followed them. The triarii knelt beneath their banners, with the left leg advanced, having their shields leaning against their shoulders and their spears thrust into the ground and pointing obliquely upwards, as if their battle-line were fortified with a bristling palisade. If the principes, too, were unsuccessful in their fight, they fell back slowly from the battle-line on the triarii. (From this arose the adage, ‘to have come to the triarii,’ when things are going badly.) The triarii, rising up after they had received the principes and hastati into the intervals between their companies, would at once draw their companies together and close the lanes, as it were; then, with no more reserves behind to count on, they would charge the enemy in one compact array. This was a thing exceedingly disheartening to the enemy, who, pursuing those whom they supposed they had conquered, all at once beheld a new line rising up, with augmented numbers. There were customarily four legions raised of five thousand foot each, with three hundred horse to every legion. Although Livy seems to suggest that many of the changes he described took place half a century earlier, back in the early fourth century, many scholars have argued that the Samnite wars may have also played a significant role in the development of Rome’s equipment and tactics. 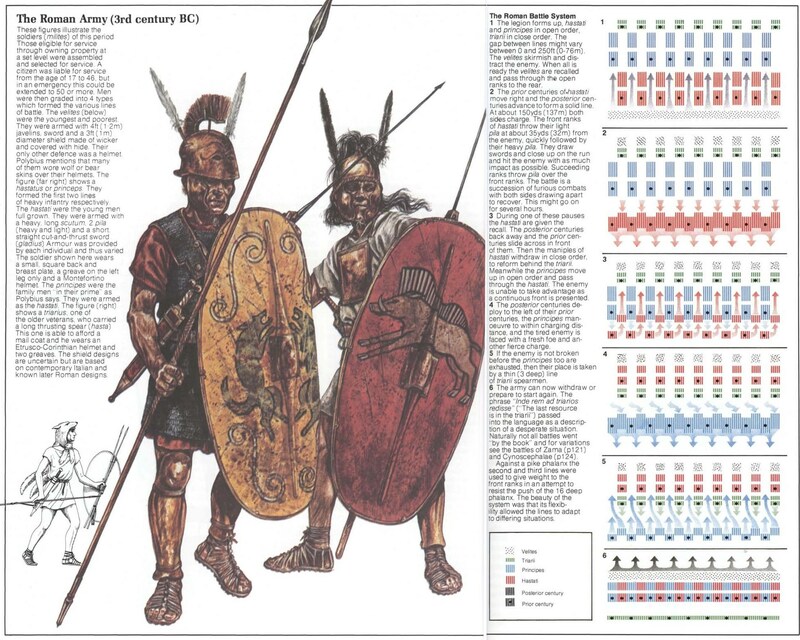 As the Romans were traditionally thought to have fought in a phalanx formation, a catalyst or impetus was needed to break apart this formation into the more flexible and fragmented army which historians, such as Polybius, describe for the third and second centuries BC. The phalanx formation had been proven to be incredibly successful across the Mediterranean, so long as armies were fighting on reasonably level terrain – like the great coastal plain of Latium. However, moving into the rugged and mountainous land of south-central Italy where the Samnites lived would have been problematic for a phalanx, and it was suggested that this is why the Romans may have struggled in the middle years of the war. These issues, along with the precarious position in which the city found itself in 311 BC, might have led to the Romans breaking up their phalanx into the manipular formation – a loose checkerboard made up of groups of 120 men of various equipment types. An army broken up into maniples or manipuli, which literally means ‘handfuls’ in Latin, would have been able to maintain tactical cohesion across broken terrain far more easily than a phalanx. Additionally, texts like the Ineditum Vaticanum, which purportedly records an interaction between a Roman envoy and the Carthaginians before the start of the First Punic War, have provided fuel for this fire. The Ineditum Vaticanum records the Carthaginians asking the Romans why they think they can engage in a naval war with them when the Romans have no experience of naval combat, and indeed no fleet. The Romans respond that they have long excelled by learning from their opponents, adapting to new types of warfare and borrowing tactics and equipment when it suited them – becoming ‘masters of those who thought so highly of themselves’. This speech and the idea of the student overcoming the master is quite clearly a rhetorical trope, although it is one in which the Romans seem to have believed – at least in the late Republic – as it generally sums up the broad narrative of military development which we find in other sources as well. Looking specifically at the manipular legion, this passage suggests that the Romans acquired oblong shields and javelins – two key pieces of equipment used by the manipular legion – from the Samnites, furthering the association between the adoption of this formation and this period. Our changing understanding of the Roman army in the fifth and early fourth century BC, however, coupled with some interesting developments in archaeology, has suggested a somewhat messier, but far more organic, sequence of development. The traditional starting point for the Roman army in the early fourth century – as a civic militia fighting in a hoplite (or possible Macedonian) phalanx formation – has generally been discarded by most modern scholars for a number of very good reasons. As a result, entering the fourth century BC there is no need to search for a reason to ‘break up’ the phalanx into a more flexible formation, as it is likely that the Roman army – based previously on a collection of disparate clans – already deployed in something resembling a manipular formation. Although they may have stood next to each other on the battle field, Rome’s military was probably still organized in small groups (based on either clans or curiae), was used to engaging in raiding activities which favoured small flexible groups and so was most likely made up of a number of individual and independent units – or manipuli – anyway. The real change in the fourth century BC was therefore not the breaking up of the phalanx, but actually bringing these various units, or manipuli, together into a single entity and fighting consistently under a single banner. The real strength or advantage of Rome’s manipular army was not new equipment or tactics per se, although the structure did allow for these, but its ability to include and incorporate a range of different units into a single military structure. This ability to integrate new groups and units seems to have originated within the community of Rome itself, as the Romans needed to have a military system which allowed her clan-based units to fight alongside community-based units, although during the course of the fourth century BC the system was also required to integrate an increasing number of allied units – most notably the Latins, but also, by the late fourth century BC, Greeks. Each of these groups seems to have had their own tactics and style of combat, in addition to different goals and aims, and the Roman system had to be able to accommodate this while still fielding an effective overall fighting force. 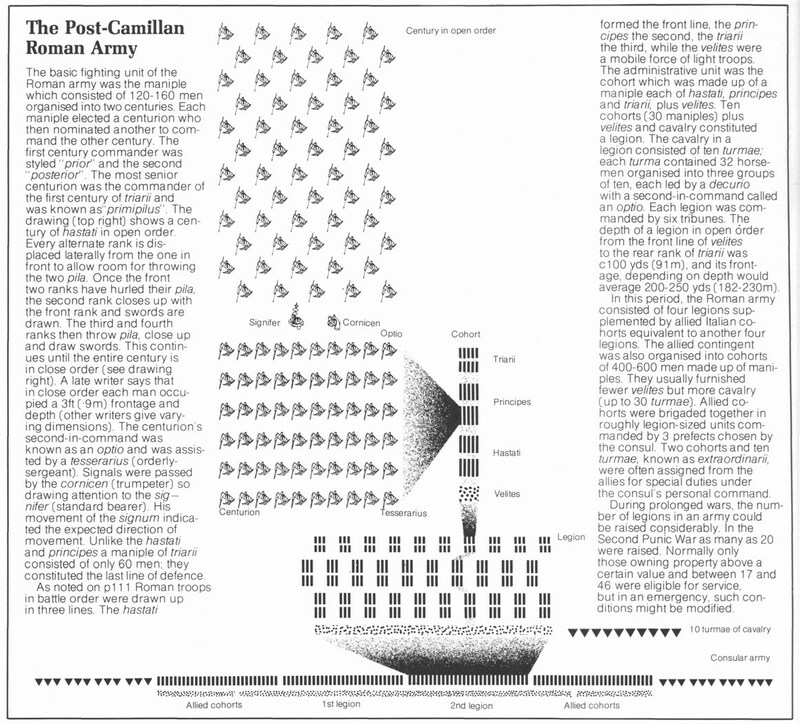 The result was an incredibly flexible system, particularly in the fourth century BC, where the Roman army would have resembled a patchwork of different units when mobilized on the battlefield: Roman and Latin gentes, equipped in their classic equipment; soldiers from the city of Rome itself, likely equipped in newer and perhaps lighter equipment; Campanian horsemen, etc. – all drawn up in their individual groups. Each unit would then go on to fight and act largely independently, utilizing their individual strengths and abilities for often quite personal gains (spoils and booty, acquired in individual combat, were still key), albeit generally working together for a common victory. Indeed, there seems to have been quite a bit of space within the Roman battle line (if this term can even be used), as the sources are full of stories of individuals and war leaders seeking each other out, riding up and down (and sometimes through) the army while it was evidently engaged, even at this late date. While the Roman army of the fourth century BC seems to have featured a number of different troop types, this sort of open formation would have also made quite a bit of sense given what the archaeology suggests was occurring in terms of military equipment in Central Italy. The region’s archaic gentes seem to have preferred fighting with large, circular shields (the aspis or hoplon), heavy body armour and thrusting spears. Although these pieces of equipment became associated with the hoplite phalanx and hoplite warfare in Greece, evidence suggests (as argued convincingly by van Wees, amongst others) that this type of equipment was initially designed to provide optimal protection in individual combat. In fact, once a dense formation is adopted, much of the defensive equipment usually associated with hoplites becomes redundant (the formation providing the bulk of the defence), as seen in the gradual removal of equipment in Greek hoplite armies – when Athens distributes equipment to hoplites for the first time in the late fourth century BC it is just a helmet and shield – and in the ‘enhanced’ phalanx deployed in Macedon where the armour is almost entirely removed in favour of a dense formation armed with sarissae. It is probable that the archaic Roman and Latin gentes continued to equip themselves in this manner in the fourth century BC, in large part because this was the equipment they already owned, and fought in a similar manner on the battlefield. Romans and Latins who had not regularly participated in warfare previously (or who at least did not have their own equipment) but who wanted to (or were expected to) join the army in the fourth century BC would have had a few more options – and it seems that quite a few adopted a new style of equipment which was increasingly in fashion at the time. Most likely introduced by the Gauls (there is extensive archaeological evidence for this type of equipment in southern Austria and other Gallic regions going back to the late Bronze Age), this equipment featured a handful of javelins and an oblong shield (offering better protection against thrown javelins, particularly for the legs). Far cheaper than the heavy bronze equipment which had been used in the Archaic period by the gentilicial elite, this new panoply was gradually adopted throughout Central Italy during the course of the fourth century BC – and particularly by the Lucanians and Samnites of South-Central Italy. The Roman association between the Samnites and this style of equipment is somewhat fitting then, although it seems as if they were not its point of origin. Instead, the Samnites could possibly be described as ‘early adopters’ – perhaps because they lacked a strong, alternative tradition of military equipment from the Archaic period. This new reliance on the javelin throughout Central Italy, albeit likely in conjunction with a backup weapon like a sword or axe, would have also encouraged a more open and flexible battle order. Unlike the Roman armies of the late Republic – where it is often thought that the Romans would follow a hail of pila with a charge and direct, hand-to-hand combat – the javelin-armed soldiers of the fourth century BC seem to have been far more lightly armed and armoured (if the depictions from tombs at sites like Paestum can be trusted). As a result, it is likely that a battle would have featured several volleys of javelins before more direct battle was eventually engaged – if it ever was. In order to allow as many units, let alone individuals, to throw their javelins as possible (and to avoid hitting allied units) a fairly loose battle order would have made sense – and here some parallels can be drawn from tribes like the Yanomamo in Brazil, which still featured this type of javelin-based warfare (including oblong shields) well into the twentieth century. The manipular army of the fourth century BC should therefore not be seen as the highly regimented and organized Roman legion described in Livy 8.8, although one can see hints of the truth behind Livy’s anachronistic façade. Livy’s velites, hastati, principes, triarii, etc. are likely the later formalizations of what were originally de facto divisions or troop types; the triarii representing the archaic warbands, with their heavy armour and long tradition of warfare, while the other groups represented various cultural, ethnic or merely economic groups, featuring the equipment which they had traditionally utilized or which they could now afford. Amongst these other groups the javelin was clearly key, although they also probably utilized a range of other equipment types and varying levels of armour. Over the course of the fourth and third centuries BC, things were gradually formalized and standardized, and the massive impact of battles like Cannae – where a generation of soldiers and a huge amount of equipment was lost – cannot be overstated, but the army’s origins seem to have been far more fluid. Despite these more organic (and possibly less impressive) origins, the development of the manipular legion in the fourth century BC still represented a major achievement. It should be noted that the ability to effectively combine units of different types, and from a number of different socio-political entities, in a single army was not unknown at this time. Indeed, the army of Philip II and Alexander the Great of Macedon arguably represents another example of this ‘combined arms’ approach – with the army unified by both the promise of payment and, later, the charisma of the leader. And of course the use of mercenaries in the Greek world more generally in the fifth and fourth centuries BC, particularly with regards to light infantry (peltasts), would have offered another example. But what made Rome’s manipular army so interesting and effective was its ability to effectively combine various units into a single army without relying on payment by the state. Instead, Rome seems to have relied upon a sense of obligation (civic duty for her citizens and treaties for her allies), along with the promise of booty after the war which included both the usual forms of portable wealth (gold, silver, arms, armour, etc.) and increasingly land (although this was reserved for her own citizens during this period). But this system allowed Rome to have an almost endless supply of soldiers for her armies, which was not limited by troop type, organization, tactics or formation, or even state finances. The strength of the system was not in its inherent tactics, formations or equipment, but actually the absence of these things. The Roman military system, like Roman society at this time, was all about integration and incorporation. This entry was posted in Ancient Warfare, Roman by MSW. Bookmark the permalink.